Today’s story, “The Strange Tale of Caribou and Moose,” was told by Cyrus MacMillan in Canadian Wonder Tales, 1918. 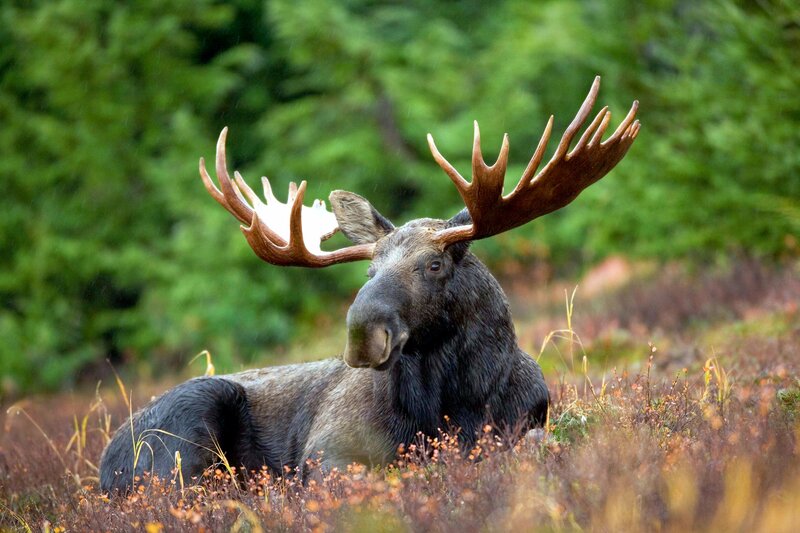 It gives us a little insight into why moose and caribou act as they do. You can read the story here. Two widows lived side by side and each had a son, one boy was Caribou, the other Moose. One spring, the two boys decided to travel, to explore the woods and the far away mountains, so they set out, apparently without any consideration for the mothers, who never reappear in the story. The first evening they came to the camp of the Porcupines, who were kind and gave the boys food and new moccasins, and told which road to follow. They also warned them that there were giants ahead. The boys continued on and came to the edge of the woods where the giants lived. There they met a woman who was half Indian, as her mother had been carried off by a giant. The woman was kind to the boys. She told them there were three giants. She gave them a small box that contained two dogs that grew bigger and angrier when they were rubbed to defeat the first giant. She told them the second giant would ask them to kill a toad on its head, but the toad was poisonous. she gave them cranberries and told them to crush them and the giant would think they had killed the toad. For the third giant, she gave them a magic knife that could not be turned aside from anything it attacked. The boys kept following the road and came to the giants. The first giant they killed with the dogs. The second they tricked into thinking they had touched the poison frog and would soon die and the giant thought he would find them on the road tomorrow for breakfast. They killed the third giant by plunging the knife into its chest. The next morning the boys decided to each go their own way. Moose went north, and Caribou went south. Moose came to a tent where a woman lived with her daughter. The mother was a witch and was jealous of her daughter. She killed every man who wanted to marry the daughter. Of course Moose wanted to marry the girl and the girl fell in love with Moose at first sight. The mother agreed, but said first Moose must do the things she told him to. That night the mother attempted to smother Moose with thick skins, but Moose used his knife to cut holes in them so he could breathe. The next day, she told him to knock the bark off a huge hemlock. He knocked it off, but jumped away before the heavy bark fell on him. Then she took him out to an island far off the coast and left him there, but sea gulls brought him back across the water. The woman was surprised but came up with another plan to kill him. She invited Moose to a wrestling match. This time Moose killed the woman, realizing that was the only way he would save his own life. Moose married the girl, but it was not all happily ever after. It turned out she could be as wicked as her mother. One day she was fishing – she could go under the water and hold her breath for a long time, catching fish with her bare hands- and it was so cold the hole froze over. She called to Moose to break the ice, but he chose not to and she drowned. He was glad. Not a good love story, is it? Moose never married again and was lonely. He did not like company any more, which is why he is usually seen by himself, and why he usually travels alone in the forest. But Caribou, on the other hand, likes company, and that is why he is usually seen with five or six others of his kind and rarely travels alone. Next PostFriday 5: What Do You Like?